Bari (Somali: Bari, Arabic: باري‎‎) is an administrative region (gobol) in northeastern Somalia. It is bordered by the Somali regions of Sanaag and Sool to the west, Nugal to the south, the Gulf of Aden to the north and the Indian Ocean to the east. It is located the tip of horn of Africa. 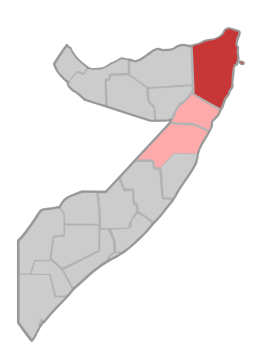 In terms of landmass, Bari is the largest province in the Federal Republic of Somalia. The highest point in this region is Mount Bahaya (2200 meters); other notable peaks include Karkaar. Most of the inhabitants of the Bari region belong to the Somali ethnic group; in particular the Majeerteen, Dashiishe and Warsangeli branches of the Harti Darod, the Leelkase Darod, and the Madhiban. According 1986 census the population was 222 thousands inhabitants. 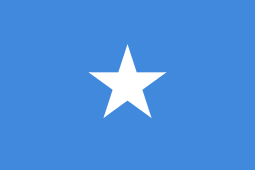 In 1998, Bari became a part of Puntland, an autonomous region in northeastern Somalia. 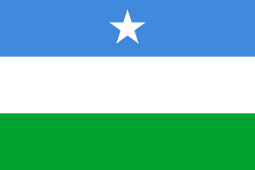 In the Transitional Constitution of the Puntland Regional Government of 2001, Puntland's territory is defined in terms of Somalia's official regions, Bari being one of them. In the years thereafter, Puntland changed its internal administrative division, and the Bari region was split in two: the southern half, roughly coinciding with the Qardho and Bandarbayla Districts, became the new region of Karkaar (also spelled as Karkar). It was subdivided into five new districts: Qardho, Bandarbayla, Waciya, Rako and Hafun. The northern half continued to be known as Bari and was split into seven districts: four of them keeping their original names (Bosaso, Iskushuban, Qandala and Alula), as well as three new ones: Carmo, Ufayn and Bargal. Radio Galkacyo reported on 19 April 2011 that a new administration, called Raas Asayr, had been declared in parts of Bari Region. Farah Mahmud Yusuf was reported to have been elected as its president. Later, Barre Fatah Said there were possibilities of starting negotiation between Puntland Government and the founders of Raas Assayr state. The leaders of this prospective polity retracted their claims a few months later in June 2012, indicating that they now supported Puntland and were satisfied with the Puntland authorities' new development projects in the region. 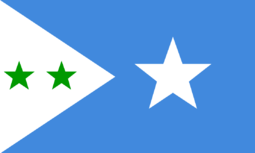 On 8 April 2013, the Puntland government announced the creation of a new region named Gardafuul. Carved out of the Bari region, it consists of three districts and has its capital at Alula. ↑ "Somalia". The World Factbook. Langley, Virginia: Central Intelligence Agency. Retrieved 6 December 2013. ↑ Robert Buijtenhuijs, Piet Konings, Wim M. J. van Binsbergen, Gerti Hesseling, Trajectoires de libération en Afrique contemporaine: hommage à Robert Buijtenhuijs, (KARTHALA Editions: 2000), p.134. ↑ Bader, Christian (1999). Le sang et le lait: brève histoire des clans somal. Maisonneuve & Larose. p. 236. ISBN 2-7068-1373-3. 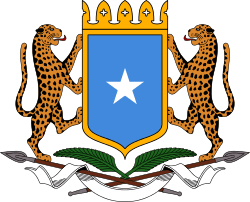 ↑ Population Statistics of Somalia Archived March 15, 2016, at the Wayback Machine. ↑ "Bari Region" (PDF). Retrieved 30 December 2013. ↑ Radio Galkacyo website, Puntland, 19/4/2011, via ARB-PSC, April 1–31, 2011, p.18811A. ↑ "No more Raas Assayr State as its founders retreated their claims and supported Puntland". Puntlandi. 11 June 2012. Archived from the original on February 12, 2014. Retrieved 21 June 2014.